Today’s salad is one of the recipes that piqued my interest in this first issue of “Ricardo“. I changed it up a bit, by using 3 kinds of baby potatoes: red, white and purple. Not only was it gorgeous to look at, but the variety of potatoes added some depth to the flavour of the salad. I really enjoyed the dressing, as it was light and didn’t mask the flavours of the salad. The recipe is simple and quick to make and I will make it again for sure. So, guess what I am bringing to Fiesta Friday this week? 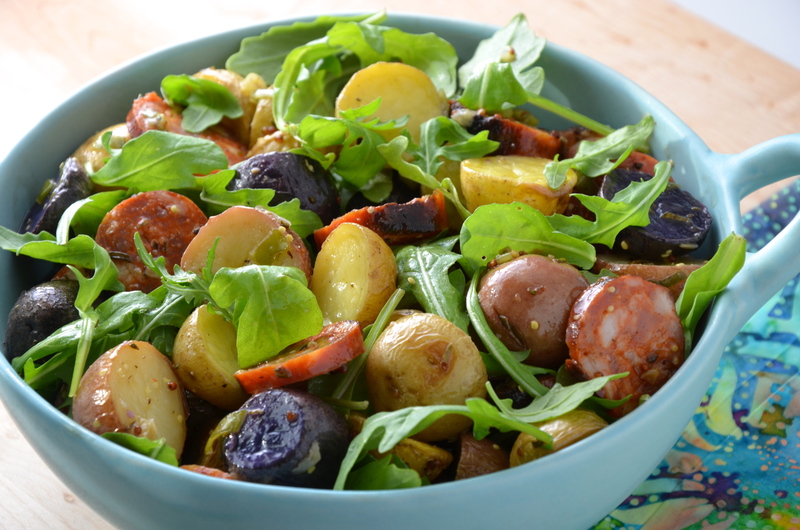 You know it: Roasted Potato Salad with Chorizo! By now, many of you know and love Angie’s awesome blog party, but if you don’t, be sure to stop by The Novice Gardener to join us! We meet up every Friday for some R and R and share what strikes our fancy! Thanks so much to Angie and the co-hosts, who take such good care of us week after week. 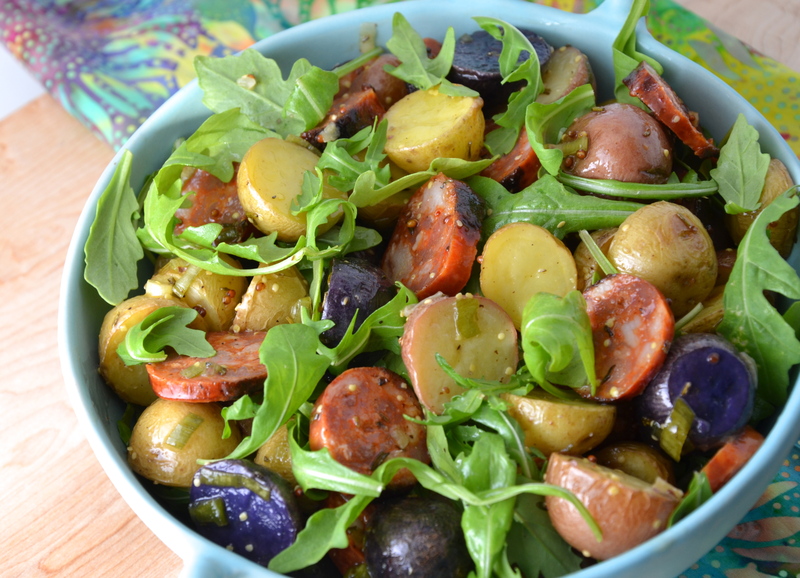 I used white, red and purple potatoes for a colourful salad. In a medium bowl, toss the potatoes, with the oil, garlic, and rosemary. Season with salt and pepper. Move the potatoes to the baking sheet. Roast for about 25 minutes or until the potatoes are cooked and golden. In a skillet, brown the chorizo slices until they are warmed through. In a large bowl, whisk together the ingredients for the dressing. Add the warm potatoes and sausage. Toss in the arugula. Serve immediately. Ricardo in Montreal is a kind of Good. He has even his own branded range of cooking tools! I find his recipes very clear and easy to follow. Your salad looks incredibly tasty Chef Julianna, is that Ricardo influence? I’m not sure, you were great even without that magazine! Oh, you are too kind, Margy! Yes, this is definitely Ricardo’s influence! Yes, One of my friends from Quebec told me that Ricardo is very famous there. I am so happy to have discovered him through his magazine. Well, thanks so much, Andy! Beautiful! Love the combination of potatoes and chorizo! It’s a perfect combo, isn’t it? My Montréal foodie friedn Sylvie has been a huge fan of Riccardo for years! I know what to ask Santa for this year. Canadian magazine subscriptions are so expensive to shop to the US but I love getting them. Thanks for the lead and for this inspired recipe, Juliana! Chorizo in anything makes my world go round:) happy FF! A beautiful salad Julianna. I will keep an eye out for this magazine – sounds like a must-read. Enjoy the weekend! I am sure you will love it, Hilda! This is what we call making dinner out of a salad! Chorizo in salad, I love it! Then again, I could eat chorizo straight up, I just love that smoky, paprika-y flavor. And thanks for the heads up for “Ricardo,” I am a cooking magazine junky so will have to check it out. Thanks for joining us at FF today and have a great weekend! Hey, Sue! It seems like many of us are good magazine junkies! Thanks so much for co-hosting this week! We all appreciate it. Now this is my kind of potato salad! Yummm! So glad you like it, Michelle! Wow, how cool is that? I have never seen him on TV, but it think I will take a look around on youtube to see if I can find him. All of my friends from Quebec have heard of him and really love him too! Thanks a million for the reblog! This looks wonderful, look at all those colors! I have made so many recipes this summer, with these bags of colourful potatoes! 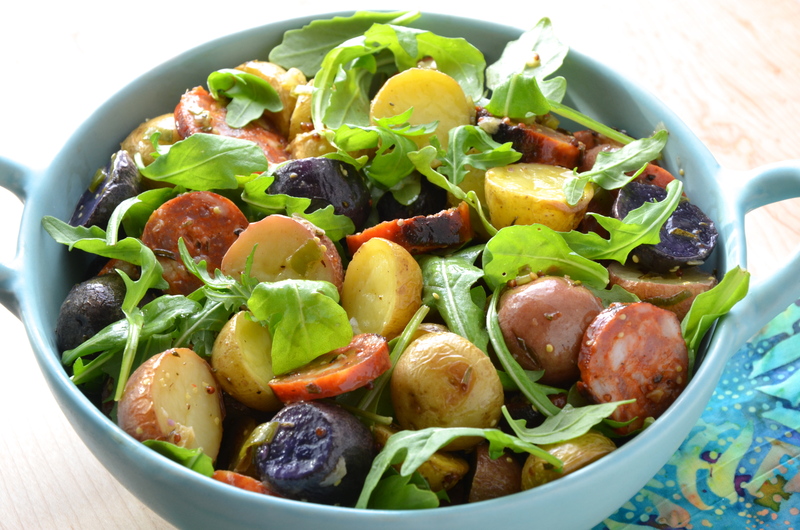 I would never thought to put Chorizo and potatoes in a salad. Looks delicious! I love that word, Chitra! “Toothsome!” So glad you like the salad! What a beautiful salad and again, your dressings sounds so delicious. I love a good Food Magazine too!! My collection of Food Magazines is currently on its way from Australia & it surprises my husband how excited I am about it! But you get me right?? Yum! This is a great-sounding salad, and I love your photos! This might go well with yams or sweet potatoes too?